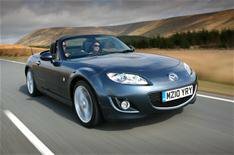 20% off Mazda MX-5 through Facebook | What Car? You can get a 20% discount off the price of any Mazda MX-5 with a new promotion operating through Facebook. Five dealerships are offering the discount to customers who collect a voucher from Facebook Deals, part of Facebook Places, on their mobile phone until March 7. The discount is more than three times the size of Target Price discounts on the car and so represents an excellent deal. To claim the discount, you need to check-in at one of the five dealerships through the latest mobile version of Facebook on your smartphone and then present the deal voucher on your phone at the showroom. Checking-in also enters visitors into a competition to win one of five MX-5 Miyako special editions. Click on the Facebook logo to become our friend.